Samsung has announced the Galaxy S10, S10+ and ‘entry-level’ S10e during its ‘Unpacked’ launch event in San Francisco, California. Given that the Ultrasonic Fingerprint Scanner doesn’t snap a photo of your fingerprint and instead uses ultrasonic pulses, it’s capable of working under cold weather conditions, which is good news for Canadians. Regarding technical specifications, the S10+’s 6.4-inch display measures in at 3,040 x 1440 pixels, while the S10’s 6.1-inch screen also comes in at 3,040 x 1440 pixels. The S10e is significantly smaller at 5.8-inches with a 2,280 x 1080 pixel resolution display. All three devices’ displays also support HDR+, a relatively new standard of high dynamic range Samsung is pushing. The S10+ features a triple rear-facing camera array with a 12-megapixel sensor with an f/2.4 telephoto lens, a 12-megapixel wide shooter with an f/1.5 to f/2.4 variable aperture and an ultra-wide 16-megapixel camera that features an f/2.2 aperture. The S10e features a single 10-megapixel f/1.9 front-facing shooter and two rear cameras instead of three. 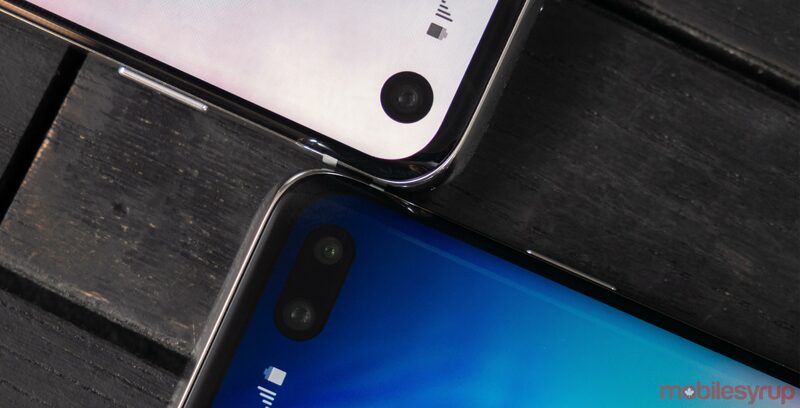 The smartphone’s first rear camera measures in at 12-megapixels with an f/1.5 aperture and the second comes in at 16-megapixels with an f/2.2 aperture. The S10+ also includes two front-facing shooters, with one working as an RGB depth sensor that allows phones to create various portrait mode effects through hardware rather than software. The front cameras measure in at 10-megapixels and 8-megapixels, with an f/1.9 aperture and an f/2.2 aperture. Other specs across the S10 line include 2Gbps gigabit LTE, Dolby Atmos surround sound support and Wi-Fi 6 compatibility. All three phones also feature Qualcomm’s Snapdragon 855 processor in Canada. 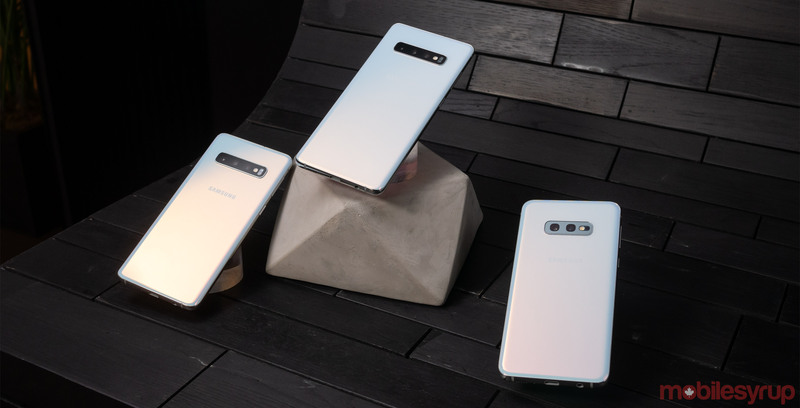 In the Canadian market, the S10, S10+ and S10e will be available in ‘Prism White,’ ‘Prism Blue’ and ‘Prism Black.’ Brighter colours like ‘Flamingo Pink’ and ‘Prism Green’ aren’t coming to Canada, according to the company. The Prism Blue and 1TB ‘Ceramic’ White variant Samsung Galaxy S10+ devices are only available at Samsung Experience stores. This is also the first time Samsung has released an ‘entry-level’ version of its high-end smartphone, the s10e. 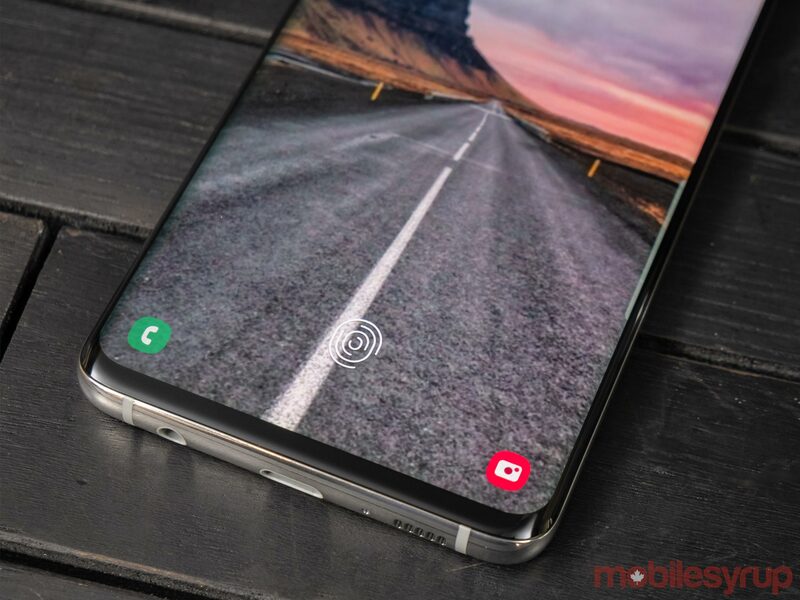 Though the S10e is similar to the S10 and S10+, the smartphone features a side fingerprint sensor and a lower resolution 5.8-inch 2,280 x 1080 pixel resolution display. The phone also seems to be positioned by Samsung as the company’s answer to Apple’s colourful iPhone XR. Concerning storage and size variants, the Galaxy S10 is available in 128GB of storage with 8GB of RAM, and 512GB of storage with 8GB of RAM. The S10+ features 128GB of Storage with 8GB of RAM for the standard version, and 512GB with 8GB or 1TB with 12GB for the special Ceramic version of the smartphone. This pricier version of the S10+ replaces the phone’s glass body with a more premium feeling Ceramic build. The S10e comes in 128GB of storage with 6GB of RAM or 512GB of storage with 8GB of RAM. 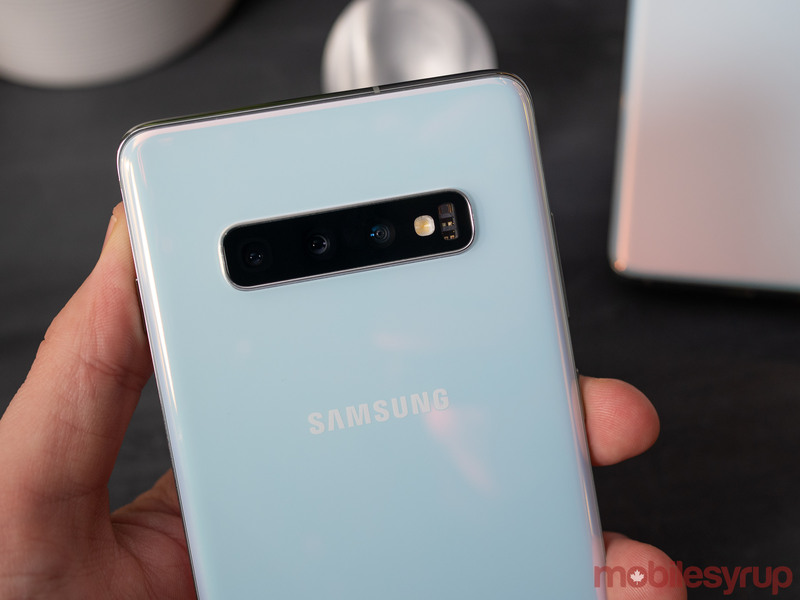 Canadian pricing for the Galaxy S10 Line starts at $1,019.99 for Galaxy S10e, $1,259.99 for Galaxy S10 and $1,419.99 for Galaxy S10+. Pre-orders for the S10, S10+, and S10E are set to go live on February 20th with the phone releasing on March 8th. 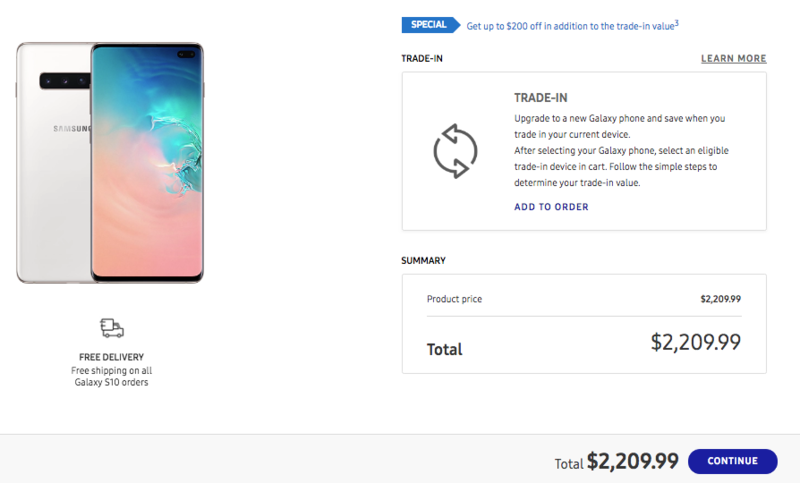 From a Canadian carrier perspective, it seems that 2-year contract pricing for the S10 starts as low as $319.99 and those who pre-order will receive the new Galaxy Buds, or a Samsung SmartThings Tracker. For more information on the S10, S10+ and S10e, check out our comprehensive hands-on with Samsung’s 2019 line of flagship smartphones. Update: The Prism Blue and 1TB Ceramic White variant Samsung Galaxy S10+ devices are only available at Samsung Experience stores. 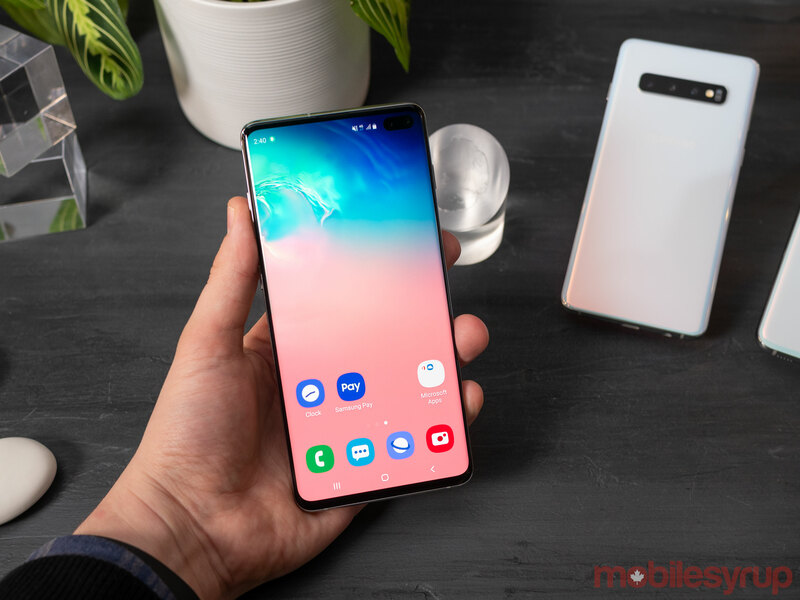 Update #2: Just for your information, the Samsung Galaxy S10+ in Ceramic White with 1024GB costs $2,209.99 in Canada. This is the most expensive version.